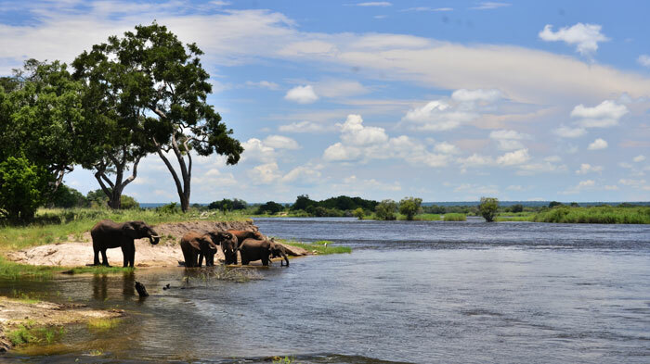 Zambezi National Park together with Victoria Falls National Park cover an area of 56,000 hectares. 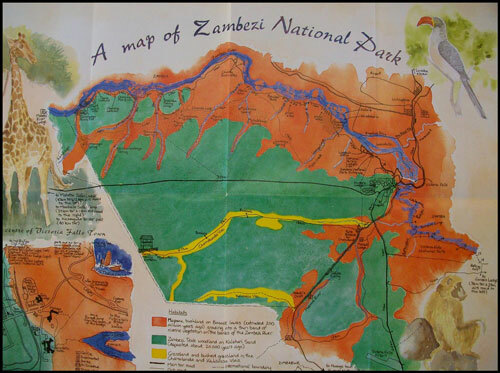 The northern border of the Park is formed by the great Zambezi River which also forms the border between Zimbabwe and Zambia for much of its length. A wide variety of larger mammals may be found within the Zambezi National Park including elephant, lion, buffalo and leopard. In addition, herds of sable antelope, eland, zebra, giraffe, kudu, waterbuck and impala as well as many of the smaller species of game can be viewed. The Zambezi River is home to over is 75 species of fish and is famous for its bream and fighting tiger fish. You can read more about fishing on the Zambezi here. 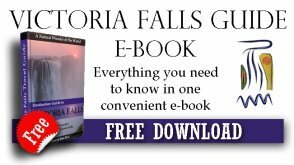 Our page on Victoria Falls Weather details the best season for various activities in the Falls. Generally game will congregate towards the river in the drier months and as soon as the rains arrive in November/December they will start to move inland to give the riverine vegetation a chance to recover for next year. It is within this park that the Upper Zambezi Canoe trips are conducted. You drive through the park to your put in point and then canoe back along the Zambezi River. Discover Safaris also operate several game viewing opportunities within the park namely, half day and full day game drives and walking safaris. Read more about Discover Safaris here. Zimbabwe National Parks has some basic self-catering lodges along the river and there are some camping facilities as well. You can read more about that on our Zambezi National Park accommodation page. Private safari camps and lodges are also dotted along the river, with a couple of them located on island of the Zambezi River. These are all luxury camps, offering fully inclusive stays with a range of their own activities. 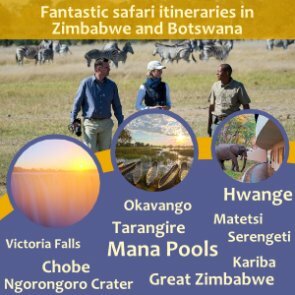 Of-course the activity operators in Victoria Falls town do not pick up from these safari camps, but the camps may offer daily scheduled shuttles into town. However, for you to fully enjoy Victoria Falls activities on offer, we recommend combining a stay at one of the lodges, with a few days within Victoria Falls town. 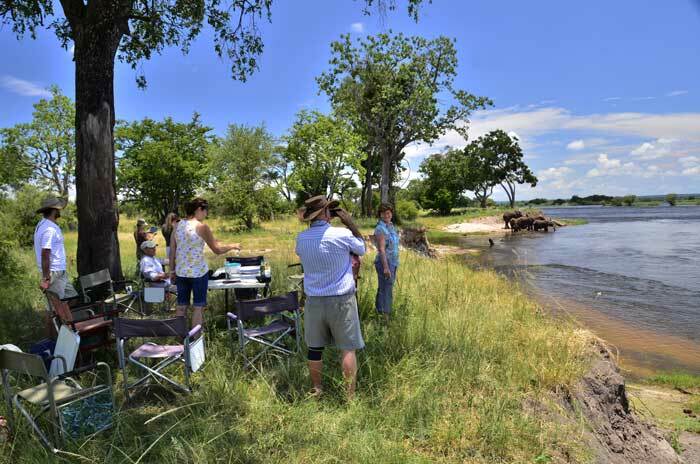 Upstream along the Zambezi River Drive, there are 25 numbered sites where day visitors may picnic or fish. These sites are attractively situated on the banks of the river and sheltered beneath the beautiful shady trees like the Natal Mahogany. If you have flown in to the Victoria Falls Airport and are staying at one of the private safari lodges within the park, most of them will pick you up from the airport. 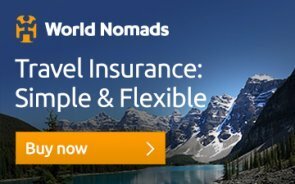 If not, a private transfer can be arranged. Contact us for more on this. If flying into Livingstone or Kasane Airports, there are a few lodges that will pick you up, but more likely, you will need to get a private transfer in. Self-drivers drive into Victoria Falls town via the Bulawayo Road or Mosi-oa-Tunya Road, then turn into Park Way Drive in the middle of town. This road will take you through the centre of town and then out all the way to the Zambezi National Park entrance gate. Park fees will be required for individuals as well as vehicles. These are detailed below. Click on the links below, they will open a new page.